The Ireland star posted a picture of the injury on his Instagram. JAMES MCCLEAN HAS been ruled out of Ireland’s upcoming matches with Wales and Poland, the FAI have confirmed. The winger posted a picture of his wrist injury, suffered in training, on Instagram and is set to undergo surgery today. The 29-year-old’s setback represents a further blow to Martin O’Neill’s side ahead of Thursday’s Nations League opener in Cardiff. The Boys in Green are already without Robbie Brady, James McCarthy, Scott Hogan, Shane Long and Sean Maguire through injury, while Harry Arter and Declan Rice both made themselves unavailable for international duty recently. There was better news elsewhere today, however. Defender Shane Duffy (groin) and midfielder David Meyler (knee), who both sat out training on Monday, were involved today. Goalkeeper Sean McDermott and forward Jonathan Walters, who were both late arrivals into camp, also trained today having missed Monday’s session. Email “James McClean ruled out of Wales Nations League clash”. 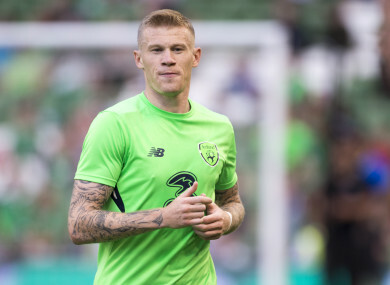 Feedback on “James McClean ruled out of Wales Nations League clash”.